Home > Accessories > Are Those Cheap Sunglasses Real Designer Label? 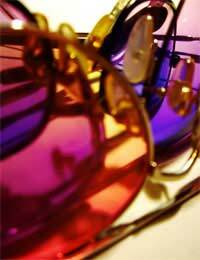 Every year, as soon as the sun begins to shine, the sellers of fake designer sunglasses come out. They can be market stall holders, street traders or small shop owners. The glasses they sell look like the real thing, and some will even have designer names like D&G, Gucci or Prada, but the eyewear is fake. Where authentic items retail for a lot of money, these sunglasses go for just a handful of change. But shades are shades, right? As long as they do the job of shielding the eyes and they look good, does anyone care? Yes, a lot of people do, actually. Not just the designers who are being ripped off in the accessories market, but also medical people, because the fakes and replicas actually don't do the job of proper sunglasses - in fact, they can damage your eyes. Proper sunglasses, both those made by the designers and just regular, but good, ones, have special lenses that have passed the British Standard test. Sunglasses are meant to protect the eyes from potentially harmful UVA and UVB rays from the sun, and should have lenses that will do this. Don't be fooled purely by dark lenses. Alone, they mean nothing. They can actually be more injurious, since they force the pupil to open wider to allow in more light. Without proper protection, that's more ultra-violet light in the eyes - which is more than they would get without sunglasses! The biggest single giveaway with fake sunglasses is the price. Instead of well over £100 for designer eyewear and sunglasses, you'll only be paying, at the outside, £20. Real designer sunglasses never go for next to nothing - and you're unlikely to find authentic Prada or Gucci at the market! If possible, look at a pair of real designer sunglasses before you go shopping and take the time to examine them properly. Hold them, feel the weight, check the design and the logos on the originals. Then compare them to the fakes and replicas. In most cases you'll notice that the fake eyewear is a lot lighter than the real designer product. That's because the materials are cheap. If you look at the hinges, they won't be anywhere near as solid - fake sunglasses will fall apart very quickly indeed. In most cases, the counterfeiters will not replicate the designer logo correctly. Remember, these fakes are made quickly and cheaply, with no attention to detail. In fact the logo can differ a little from one arm to the other on these sun shades. The arms should also be marked with the model number, along with the frame size and colour. You won't usually find that on cheap sun goggles. Most fakes or replicas won't have the tags that go with the real designer item. Expensive sunglasses will always have a tag - if you've seen the real thing, you'll know what it's like. If it's missing, the eyewear is fake. The same applies to the packaging. Understandably, if you're spending a lot of money for sunglasses, you want good packaging - and the designers want to advertise their brand with their logo on a case. If there's no case, or it's just plain cheap cloth or felt, then you know you have a fake. At the end of the day it's pretty simple - if they're not designer prices then they're not designer glasses, end of story. Real bargains don't exist, or if they do they're so rare that they're almost like fairy stories. Use common sense and don't go spending money hoping for something that won't ever happen. If more people thought firsdt, then there would be fewer counterfeit sales.